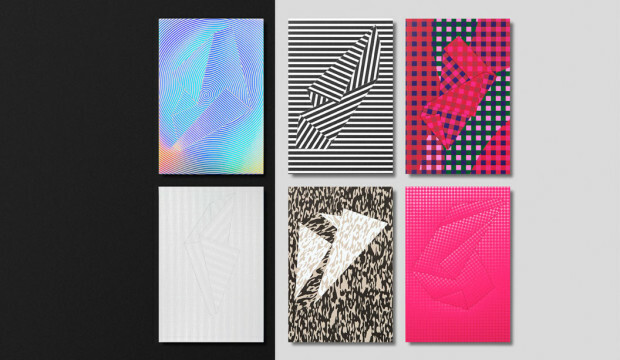 We recently released an A5 sampler created by A Friend of Mine (AFOM) design studio in Melbourne, consisting of a set of seven cards wrapped in an origami folded B2 sheet. And we folded them all in-house. We owe a lot of people a big thanks for their help! 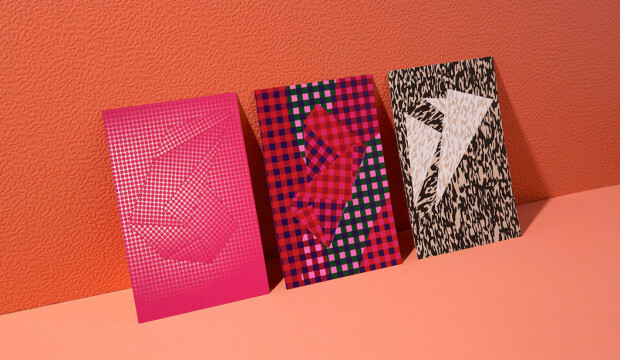 Inspired by the shape formations found in paper, each card in the sampler showcases a variety of digital print techniques and a custom perforated shape. It’s been a doozy of a production project but worth it. We wanted to share some important printing hints and tips around the Curious Collection Skin Red 270gsm card. The red card was printed on a HP Indigo press using CMYK, white AND fluoro pink ink. 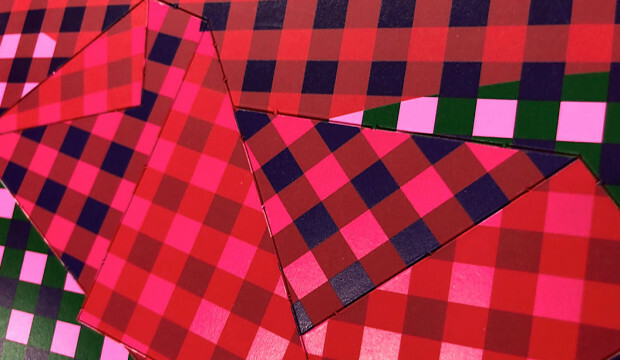 The checked pattern looks simple enough but delve deeper and there’s quite and few tricks we implemented to really make it pop. We did the hard yards so you don’t have to. Designer: A Friend of Mine. Photography: Sarah Anderson. The artwork file is made up of seven layers. Getting the order of ink lay down is imperative. To get the tonal effect between the opaque and translucent areas of ink, the white gets laid down first, 3 hits to be exact. Then we follow up straight away (electro ink dries instantly) with the CMYK. 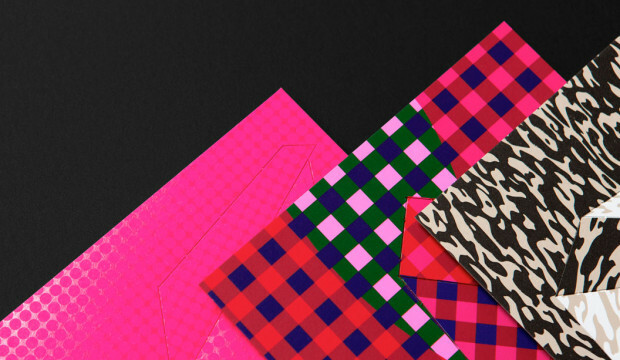 On this piece CMYK shows up as the green, navy blue, magenta and maroon layers. To ensure they sit over the white, all CMYK areas need to be set to OVERPRINT. For a further explanation of what overprinting is click here. The ink that hits the white becomes opaque and has a bolded look. Ink printed directly onto the paper looks more transparent and subtly shows the stock colour underneath. Finally, the fluoro pink ink is laid down. Fluoro ink has a translucency so when it hits the white ink it pops as pink but when it hits the red stock it makes a slightly darker red shade. Important to also mention that printer’s proofs are essential, especially when working with white ink. We went a few rounds with these before getting it right and consulted the printer regularly to achieve the desired result. Look out for registration too, with so many layers it’s important the edges of the pattern all line up. Finally there is a lot of ink coverage on this card, however AFOM has been mindful to keep some areas of the paper ink-free for all the paper lovers out there who want to feel Curious Collection Skin’s silky tactile goodness. If you ever have any production questions, speak to your business development executive or call our marketing department on either 02 8863 1266 or 03 8794 3407.